The IBM 805's speed was limited only by the operator's ability to insert sheets in the machine and record the scores. An experienced operator could record scores on answer sheets at the rate of about 800 sheets per hour or call the scores to a recording clerk at the rate of 1,000 sheets an hour. 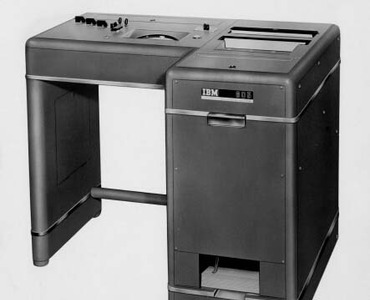 A later version of the IBM 805By employing a special unit, the test scoring machine could also be used to obtain weighted averages. The IBM 805 was withdrawn from marketing in January 1963.